The world’s coral reefs are in dire need of some love. Global warming and ocean temperature spikes have left massive stretches of vital coral reefs damaged, possibly beyond all repair and if we don’t do something to stop the continuing damage it’s going to cost mankind dearly. But studying coral is no easy task, so researchers from the US Office of Naval Research and Florida Atlantic University have come up with a solution. The issue at hand is the fragility of coral itself. It’s incredibly hard to monitor reef habitats and the health of the reef ecosystem using human divers or bulky equipment which could cause damage. The solution? Soft-bodied robotic jellyfish. Using the moon jellyfish as inspiration, the scientists built prototypes to test the feasibility of using a simple hydraulic movement system to allow their creation to move around in the water with very little effort. 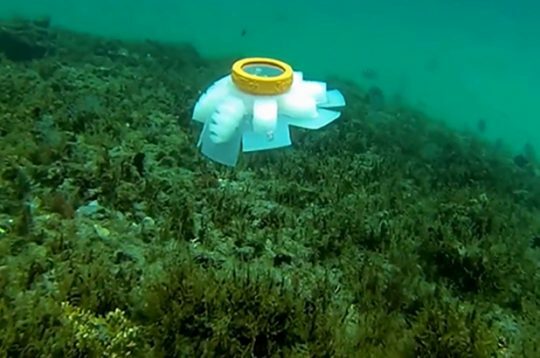 The work paid off and the result is a small robot that can move effortlessly along a coral reef without risking any damage. A research paper based on the work was published in Bioinspiration & Biomimetics. The soft exterior of the robot, which is made of a rubbery silicon material, allows it to squeeze through tiny gaps. A future iteration of the robot could even incorporate a sonar sensor to gauge the size of openings before muscling through them, Dr. Engeberg noted. In the future, robotic jellyfish like these could be outfitted with any number of sensors to monitor water temperature and quality or even relay images of various parts of the reef to scientists on shore. These eyes-in-the-sea, so to speak, could be vital to monitoring ongoing reef recovery efforts worldwide.